Author VJ Cast brings 25 turbulent years of lived experience with mental illness together with creativity, humour and intentional questions to help those struggling with a little-discussed, but widespread issue: youth depression. Challenging the Black Dog features an eclectic array of exercises based on proven therapy techniques, presents users with a particular type of compassion and understanding and nurtures the exploration of creativity, mindfulness, and self-reflection. Mixed among these engaging prompts are stress-relieving colouring pages and the occasional inspirational quote. The aim is to provide a safe, private and highly personalizable place for you to get to know your Black Dog. Best of all, the psychologist-guided material allows for the journal to be easily used either as a form of affordable, self-guided therapy in private or in addition to working with other medical interventions, such as psychologists and therapists. Challenging the Black Dog will help transform you into an active participant in your journey towards recovery and self-discovery. Isn’t it time you started the challenge of leashing your Black Dog and reclaiming control over your psychological well-being? “I strongly recommend it not only for those who are experiencing the pain of depression, but for all who wish to reflect deeply with the personal factors that can bring us darkly down and those that can bring us back to renewal and light.” - Brian R. Little, Ph.D., Fellow, Well-Being Institute, Cambridge University. “…a resource for depression sufferers by a depression sufferer… it provides hope and will complement professional expertise.” - Patrick McGorry AO MD PhD FRANZCP, Professor of Youth Mental Health, Orygen, the National Centre of Excellence in Youth Mental Health. 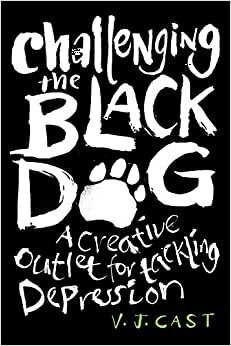 "Challenging the Black Dog is immensely creative, using humour and intentional questions to encourage personal reflection... There’s something for everyone in this book." - Associate Professor James Scott, Child and Youth Psychiatrist, Queensland Centre for Mental Health Research. "...why shouldn’t the exploration of depression be creative, stimulating and ultimately uplifting? Challenging the Black Dog effectively takes the currently popular, designer “happiness journal” to a new level and depth, confronting the reality of living with depression in a format that can be both pleasurable and relatable." - Professor Jill Bennett, Director of The Big Anxiety: festival of arts + science + people, Australian Research Council Laureate Fellow, UNSW AUSTRALIA. "Challenging the Black Dog is significant in that it does not hand you answers, but rather sets you up to find them yourself." - Sam Webb, Actor + Co-founder of Australian mental health organisation, LIVIN. "You can write in it, draw, vent, scribble random things that are important and inspire you. Treat it as your companion. It’s here to help and encourage you. It’s a support crew in your own corner, there to use anytime, anywhere." - Belle Brockhoff, Professional Snowboarder & 2x Olympian. "Challenging the Black Dog presents a refreshingly original approach to grappling with depression. The exercises here spark a creative process that simultaneously grounds and explores. I wish I’d had this book in my teens and twenties." - Mark Pellegrino, Actor, Supernatural and 13 Reasons Why. VJ Cast has spent over two decades struggling with depression, social anxiety, trichotillomania, disordered eating, bipolar II and, more recently, the chronic pain caused by fibromyalgia. She used these experiences to guide both her non-fiction writing imprint, Offbeat Brains (offbeatbrains.com), a for-profit social enterprise. She spent her teen years living overseas, which involved needing to carry a gas mask at school (Gulf War I) and surviving a Molotov cocktail landing on her bed and setting it on fire while she was in it. These days she leads a quieter life home-schooling a tween daughter on the spectrum while living on a small island off the coast of Queensland, Australia which has an abundance of wildlife and far too many friendly mosquitoes. Her hair colours, like her medications, are subject to change. Plently surprised with activities to keep the mind active and in the moment.